The English painter John Frederick Lewis (1804–1876) was a fascinating and brilliant enigma to his contemporaries, and remains so today. He was certainly no pompous, verbose Victorian bore. At a dinner of the Society of Painters in Watercolours, Lewis delivered a memorable presidential address, rising from his seat, saying nothing, and promptly sitting down again. This minimalism is, however, completely belied by his complex, intricately wrought and undeniably beautiful art. Lewis’s career crossed locations (England, Spain, Turkey and Egypt), subject matter (animal, sporting, topographical, landscape and genre), and media (engraving in his father’s studio, oil painting, drawing and watercolour painting, then a return to oils). 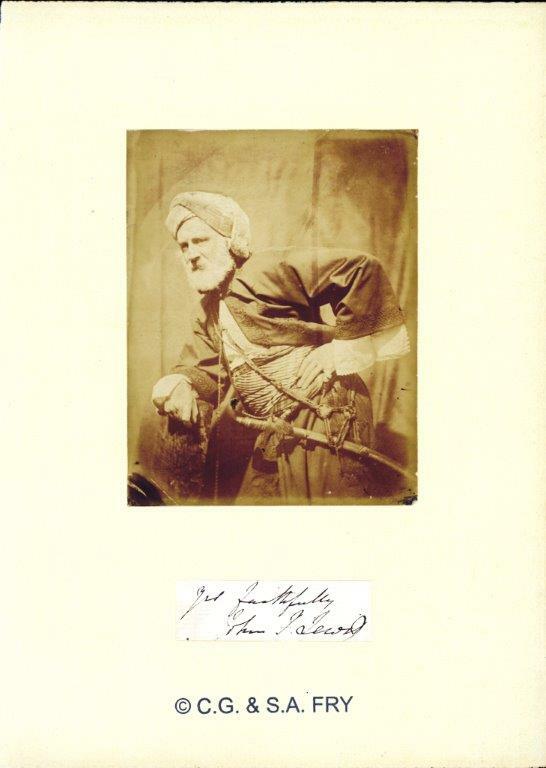 A highly successful and productive couple of years in Spain (1832–33) gave the so-called ‘Spanish Lewis’ a desire to travel further, and so in 1837 he went via France, Italy, Greece and Turkey to Cairo, where he arrived in 1841 and would spend the following ten years. He was vividly portrayed as a ‘Turkified European’ by the famous writer W.M. Thackeray in Notes of a Journey from Cornhill to Grand Cairo (1846). Returning to London following enthusiastic critical response to his work, Lewis spent the remaining 25 years of his life in the comfortable seclusion of Walton-on-Thames, producing paintings that drew heavily on his Cairo observations and experience. 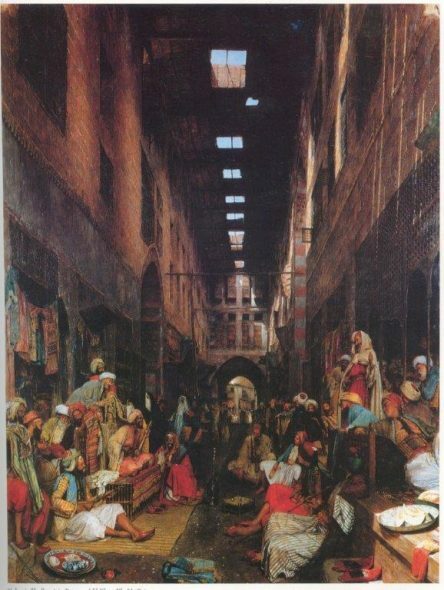 As an ‘Orientalist’, Lewis’s art historical significance compares with that of his more famous French near-contemporaries Eugène Delacroix and Jean-Léon Gérôme. The closest Aotearoa New Zealand parallel to Lewis is surely C.F. Goldie, whose technical exquisiteness and intricacy invests his art with immense mana. The big difference between them, however, is that unlike the ultimately reactionary, entrapped Goldie who was in denial of modernism, Lewis explored a considerably wider range of subject matter, and remained impressively productive until his death. 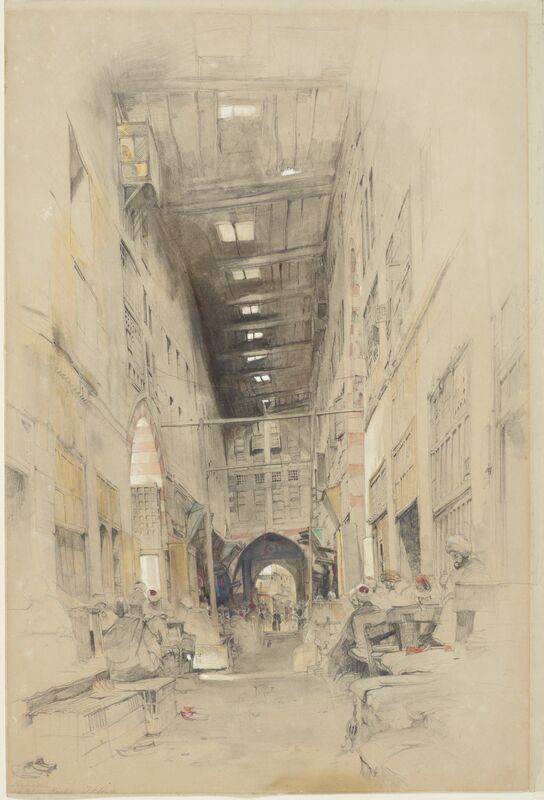 Te Papa owns five watercolour studies by Lewis, of which The Bezestein Bazaar, El Khan Khalil, Cairo, is the largest and most significant. 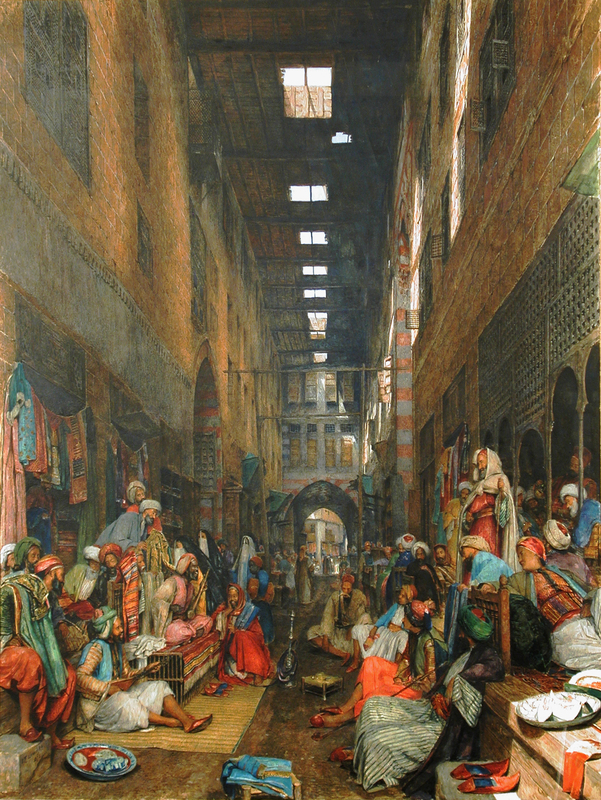 Until recently, it has been known as The Bazaar of the Ghûriyah, Cairo, but conclusive evidence coming from the Lewis expert Briony Llewellyn establishes that both the setting and the vantage point correspond perfectly to Lewis’s important late ‘Bezestein’ paintings of 1872 and 1874, the former a watercolour in the Higgins Art Gallery & Museum, Bedford, UK, and the latter an oil in a private collection. The two jumbled bazaars are actually located in very close proximity; the generic Khan al-Khalili souk (market-place) district, frequented by tourists and locals alike, encompasses them both. The Te Papa watercolour cannot be conclusively dated, but Llewellyn’s recent research strongly suggests that it was executed in about 1843–44. To mix our metaphors, Cairo was a Mecca for intrepid European (especially British) travellers and artists who sought exoticism and ‘otherness’ to break the monotony of a pampered and predictable lifestyle back home. As Nicholas Tromans, curator of the exhibition The Lure of the East (2008) explains, Cairo held ‘a spectacular concentration of Islamic architecture’, ranging from bazaars to mosques to the Pyramids, and ‘was simply the most magnificent Oriental city within easy reach of Europe’. Lewis’s friend Thackeray vividly explained the city’s appeal, admiring ‘the fantastic splendour; the variety of the houses, and archways, and hanging roofs, and balconies, and porches; the delightful accidents of light and shade which chequer them; the noise, the bustle, the brilliancy or the crowd; the interminable vast bazaars with their barbaric splendour! There is a fortune to be made for painters in Cairo…’. Thackeray’s last few words apply perfectly to the Te Papa watercolour and, prophetically, to Lewis’s subsequent career. Artists often jealously and zealously store motifs, ideas and studies for future consumption, just as squirrels bury their nuts. Here the otherwise dissimilar Albrecht Dürer, John Frederick Lewis and Colin McCahon all connect. Lewis is particularly interesting in this context. Thackeray vividly portrayed him as a languid lover of oriental luxury, living in an elegant Ottoman house, with a collection of oriental costumes and artefacts, naturally boasting a cute pet gazelle in the courtyard. While Lewis surely relished his ‘lotus-eating’ moments, in the course of his decade-long residence in Cairo, the artist was also busily engaged in making a few hundred watercolours and drawings. As in the case of The Bezestein Bazaar, these provided the blueprints for the quarter-century of watercolours and oils that followed his return to England. If you reckon that Lewis’s vision was destined to become repetitive and stale (unfortunately this often applies to the later Goldie), then think again. Paintings like A Lady Receiving Visitors (The Reception) of 1873 (Yale Center for British Art, New Haven) are as scintillatingly brilliant and irresistible to viewers today as when they were first exhibited at the Royal Academy. Te Papa’s Bezestein Bazaar reveals, not unlike our current exhibition of etchings by Louis Conrad Rosenberg, an artist’s astute architectural eye. Lewis vividly conveys the sombre covered structure, providing a refuge from the heat, while light filters through the top-lit windows. He has carefully observed the terracotta banding of arches and pillars, and latticework on the walls. The bazaar is rickety, even tatty, yet it is also venerable and sublime. Although the foreground is unfinished, the middle ground figures convey a lively human presence, amplified by red bodycolour patches applied to the turbans. Further nice touches include the slippers on the floor, and what appears to be a foreground figure of a gazelle beholding the bazaar. In the later watercolour and oil renditions of almost thirty years later Lewis gives full vent to his jewel-like colours. Equally important, he fills the composition with a jovial cast of buyers, sellers, friends and family, telling stories to one another. A foreground figure hints that music isn’t far away. Tromans contrasts the easy going mood with male-only genre paintings set in Britain, ‘in which the exhibition-going public were on the whole used to seeing men behaving badly when left to their own devices’. Kiwis would probably fare little better! Is the figure towering over all the others on the viewer’s right Lewis himself? It was a witty conceit on the artist’s part to include a self-portrait dressed like a local among his compositions. Such a ploy is a precursor of Alfred Hitchcock’s cameo appearances in many of his films. In another painting set in the same location, In the Bezestein, El Khan Khalil, Cairo (The Carpet Seller), the figure of the title is none other than Lewis himself. Only nobody realised this or else if they did – and were friends of Lewis – then they didn’t let it on to the press! The sculptor Thomas Woolner informed Lewis of the businessman, MP and art collector William Graham’s admiration of The Bezestein Bazaar oil version when it was exhibited at the Royal Academy in 1874: ‘He… asked me if I thought he could get it for £10,000, for which he would willingly give if it were possible to buy it’. But the owner, David Price, wouldn’t part with it. 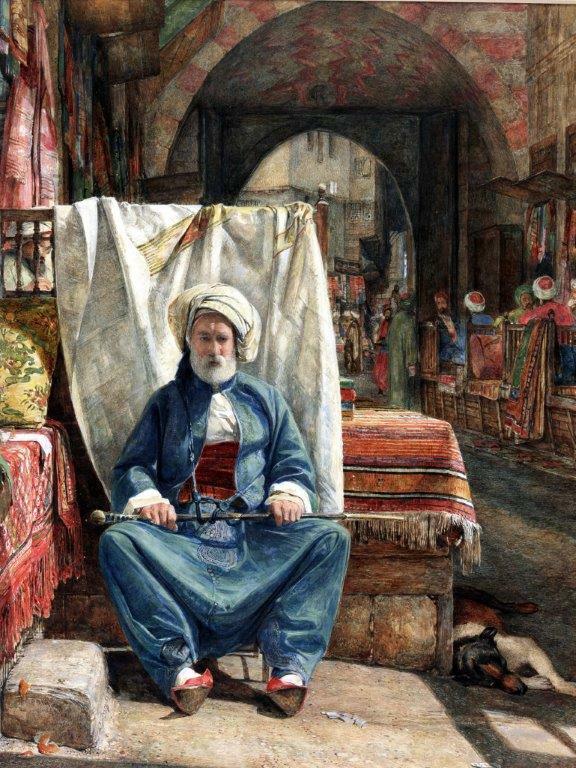 Today the art of John Frederick Lewis remains just as coveted, and rightly so.